Kevin Shiley (middle) and Cosapi employees discussed future opportunities for BYU-PathwayConnect students. 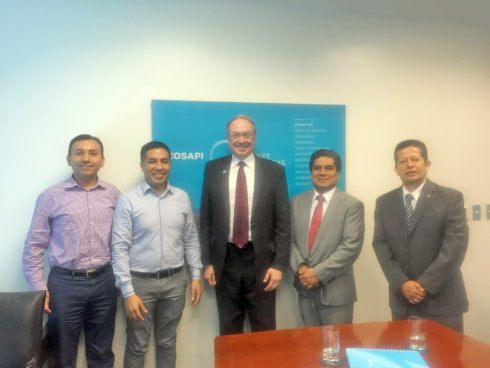 In early March and May, BYU-Pathway Worldwide and Self-Reliance Services met with companies throughout Guatemala, Mexico, El Salvador and Peru to explore employment opportunities for the benefit of the local PathwayConnect and online-degree-seeking students. BYU-Pathway Worldwide area managers and Associate Dean of Curriculum, Kevin Shiley, along with local Self-Reliance Service managers, met with Walmart, CoparMex, Accenture, Marriott, Universidad Tecmilenio, Cosapi, Cencosud and other major organizations to explore career opportunities for PathwayConnect and online students. These discussions also inform BYU-PathwayConnect curriculum development to create and improve certificates and degrees that will directly prepare students for local employment and how PathwayConnect and online certificates increase the value graduates of the program can offer each organization as potential employees. 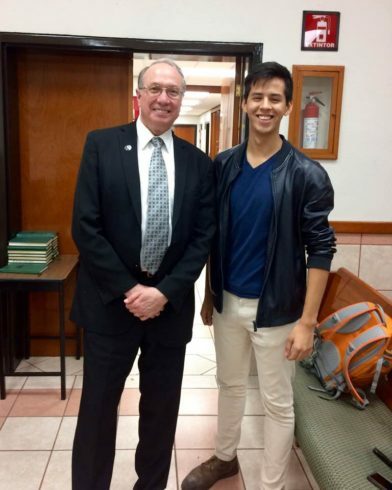 Kevin Shiley with PathwayConnect student Sam Rodriquez at an Online Programs presentation in Monterrey, Mexico. Students in these programs learn skills valuable for retail, customer support, information technology and management positions upon completing a certificate or degree through BYU-Pathway Worldwide. Also, the English improvement that is taking place within these online programs can be beneficial to these companies, especially in management positions. Moving forward, BYU-Pathway will continue to network with various companies for the benefit of the online students throughout the world and will hold similar meetings with corporations in India in August. 2016 Pathway Annual Report Learn about key accomplishments, enrollment statistics, future initiatives, and more.